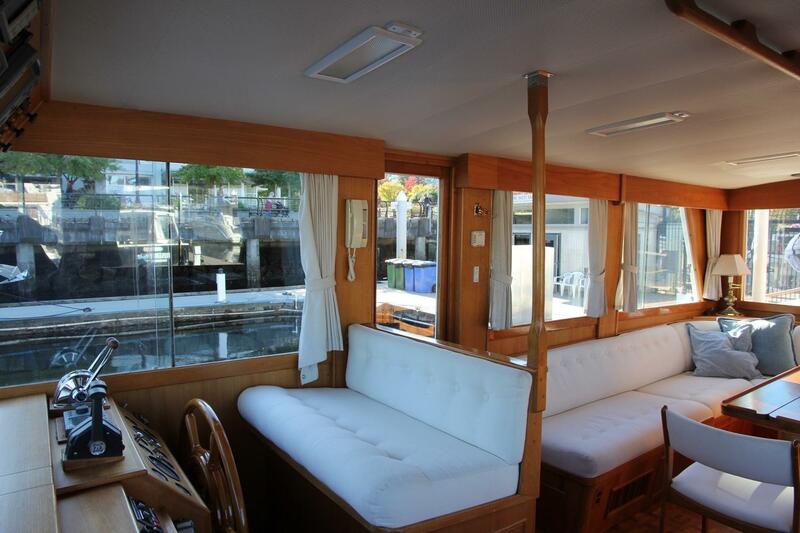 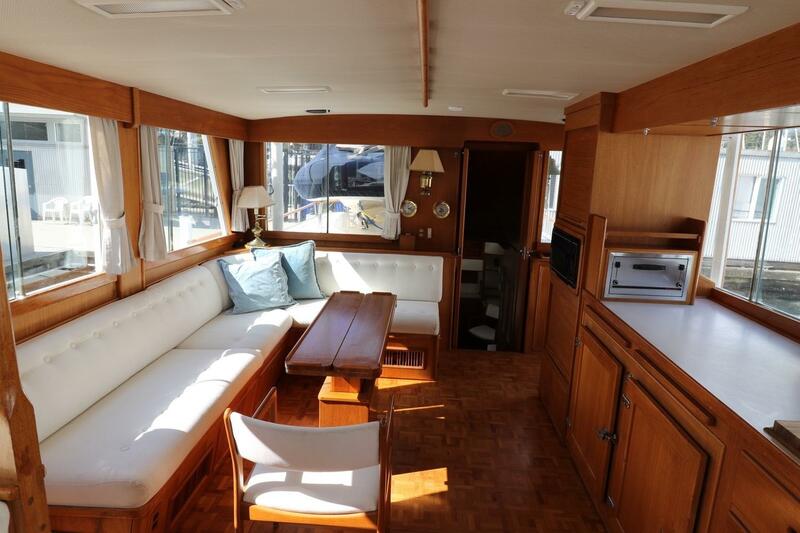 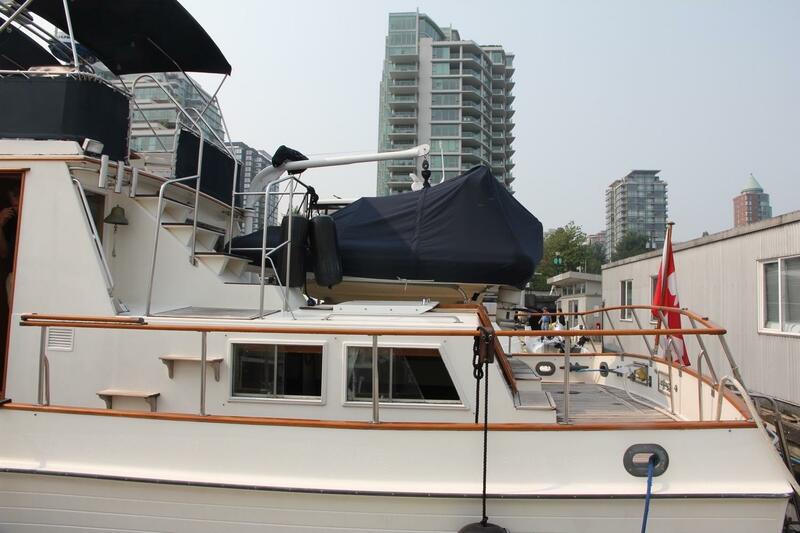 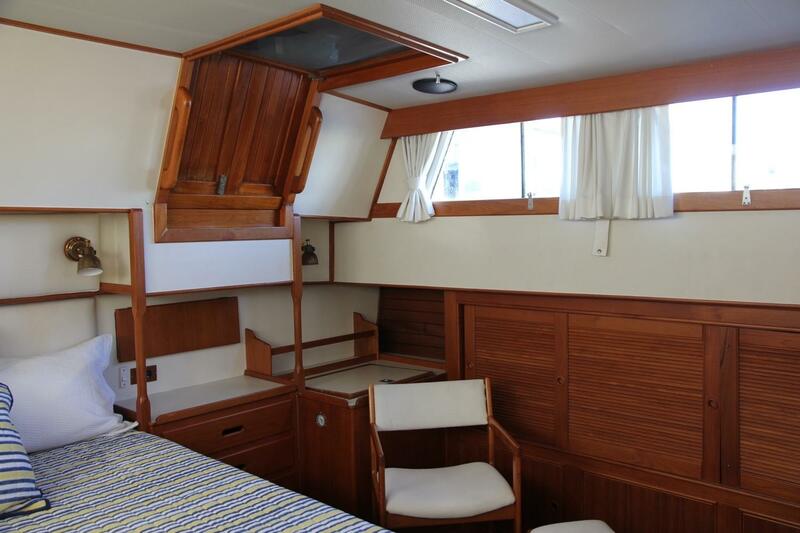 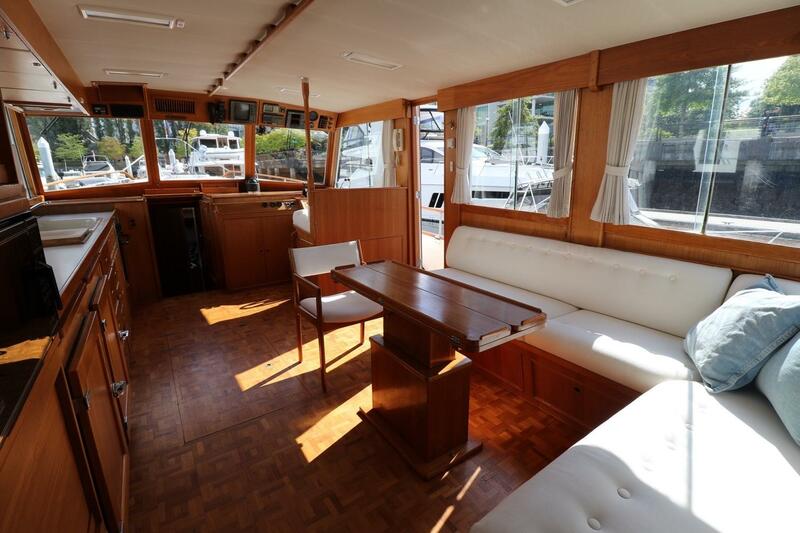 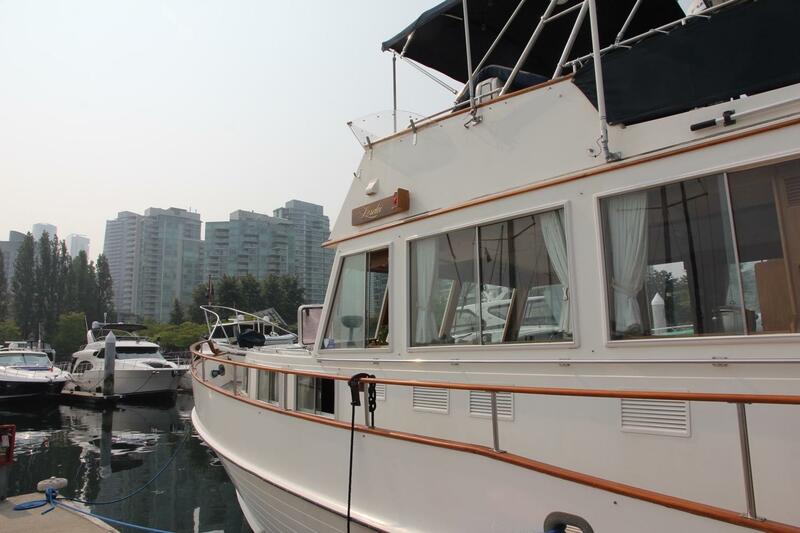 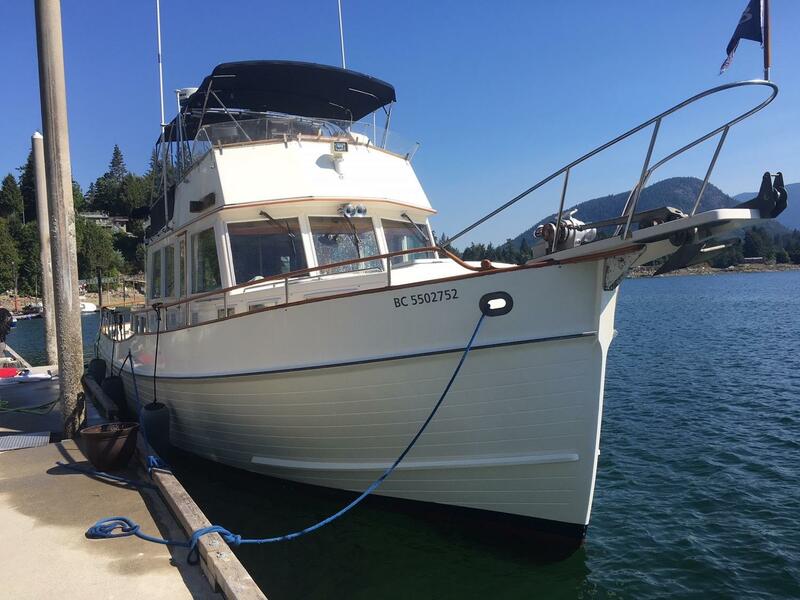 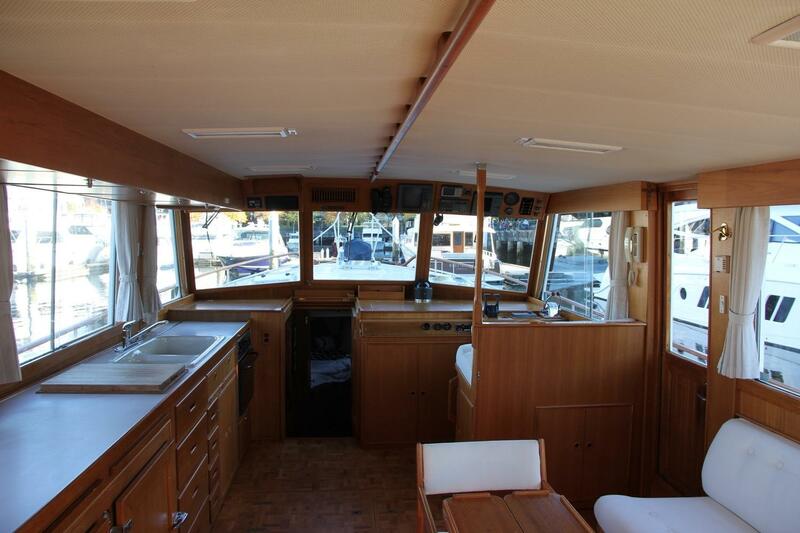 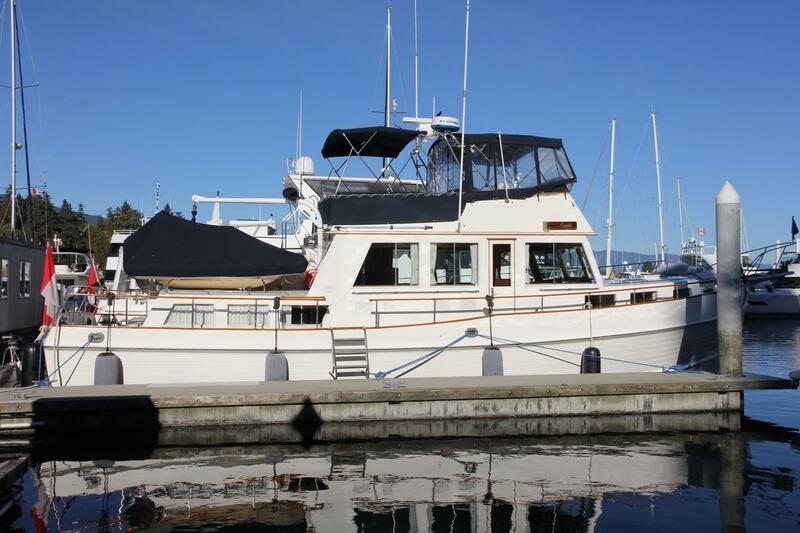 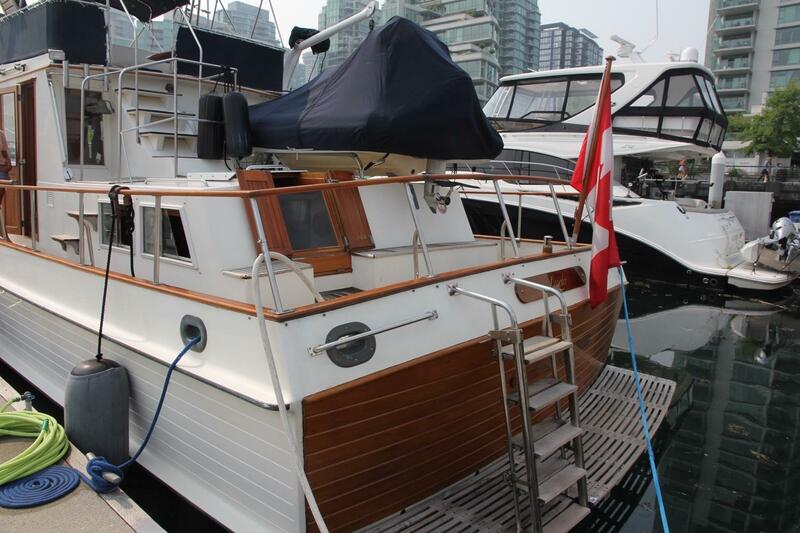 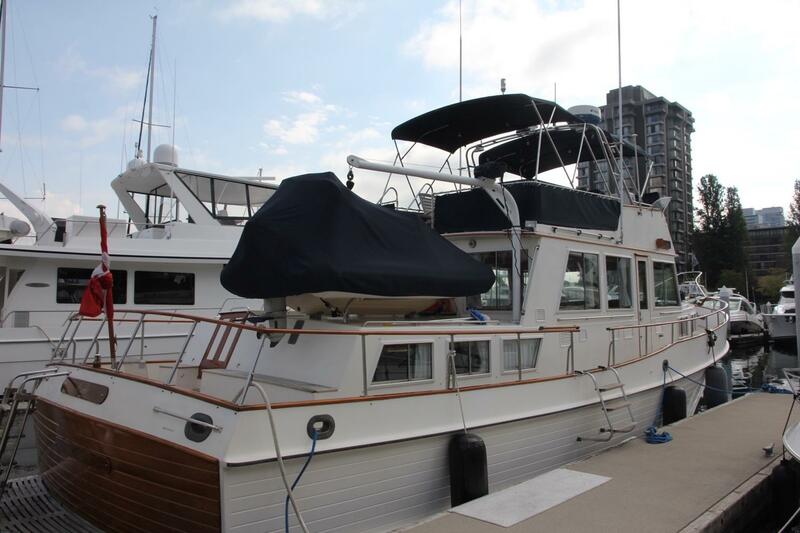 "Lorelei" is a wonderful example of a 49 Grand Banks Classic tri-cabin trawler with a three cabin, two head layout. 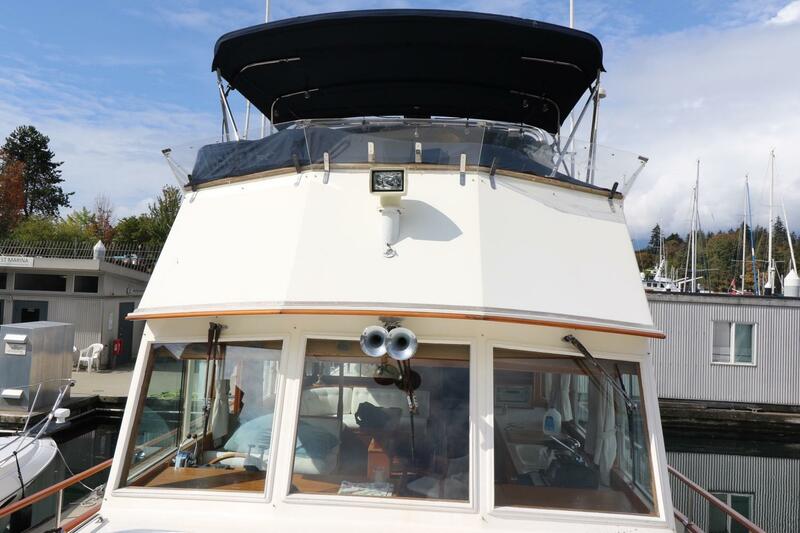 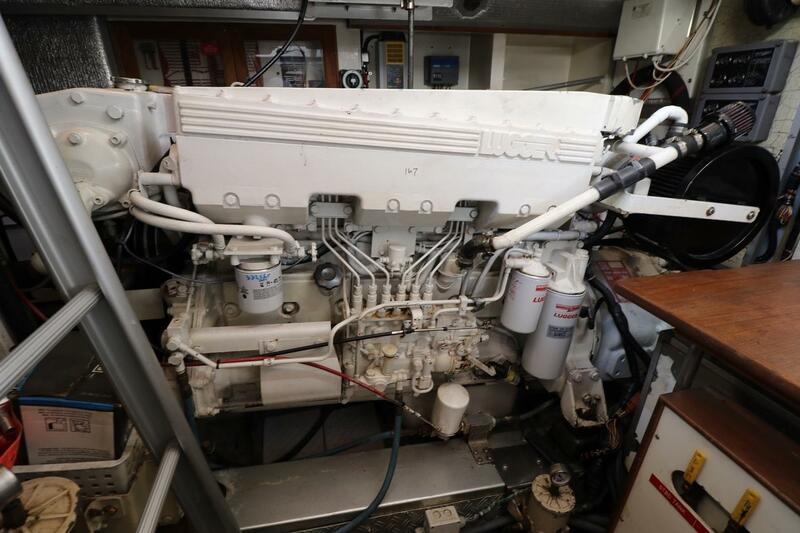 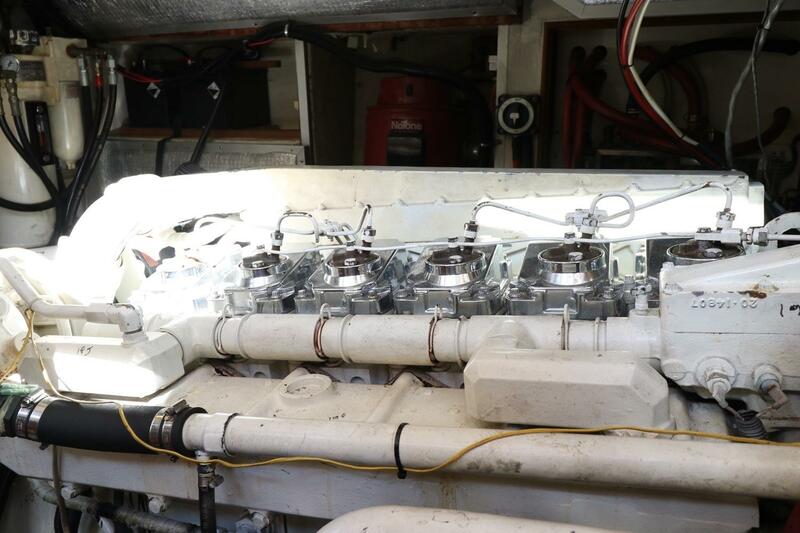 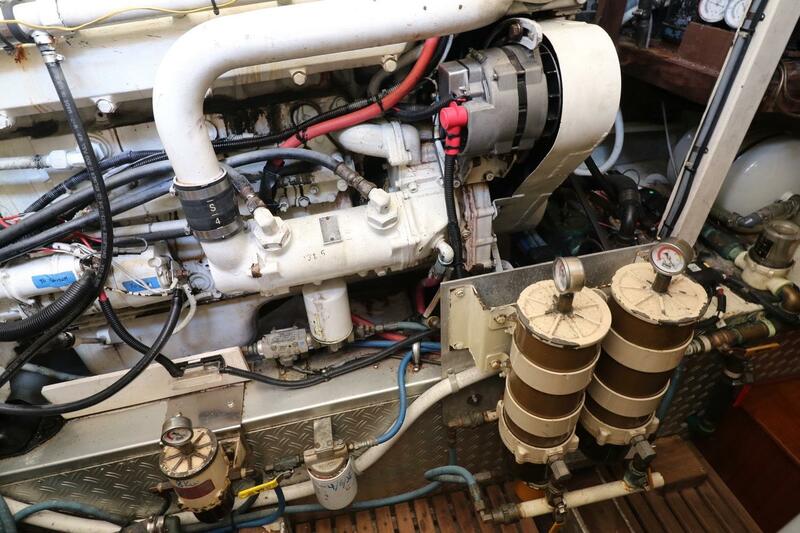 Powered by Lugger engines and outfitted with stabilizers, generators, watermaker, air conditioning, diesel heat, tender, davit, canvas bimini and enclosure. 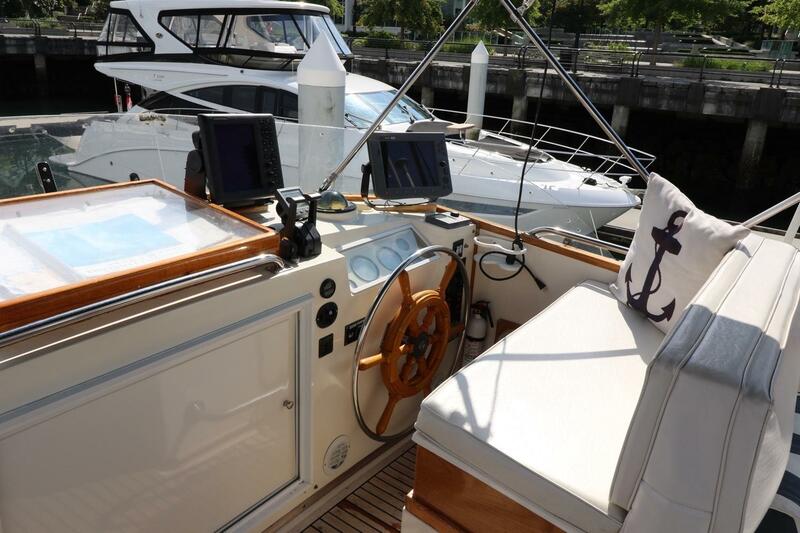 All equipment designed for comfort, reliability, and safety. 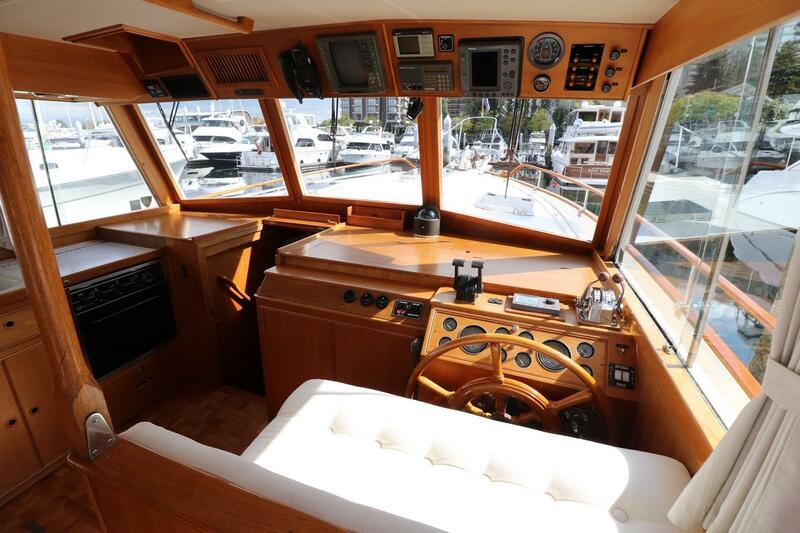 This beautifully designed yacht is ready for comfortable cruising and heavy seas the Grand Banks 49 is a vessel to explore and admire. 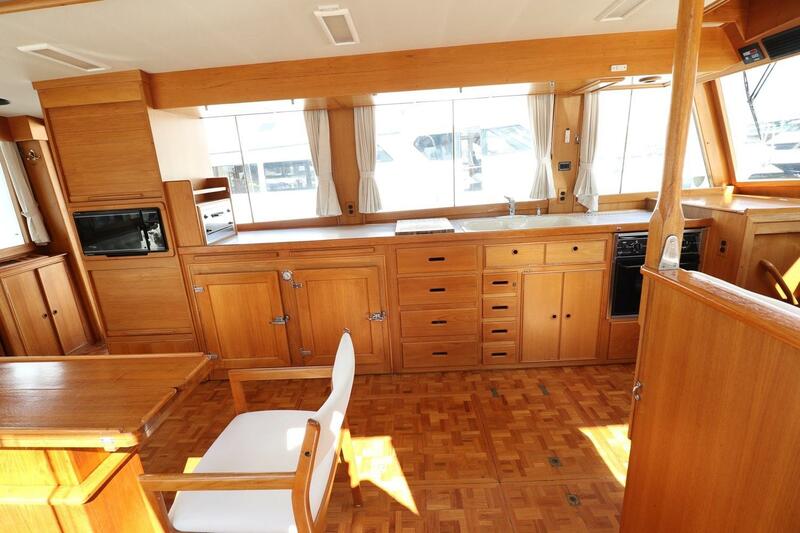 The quintessential Grand Banks Classic model was introduced in 1965, in 1980 the 49’ version took motor-yacht elegance and sophistication to the next level. 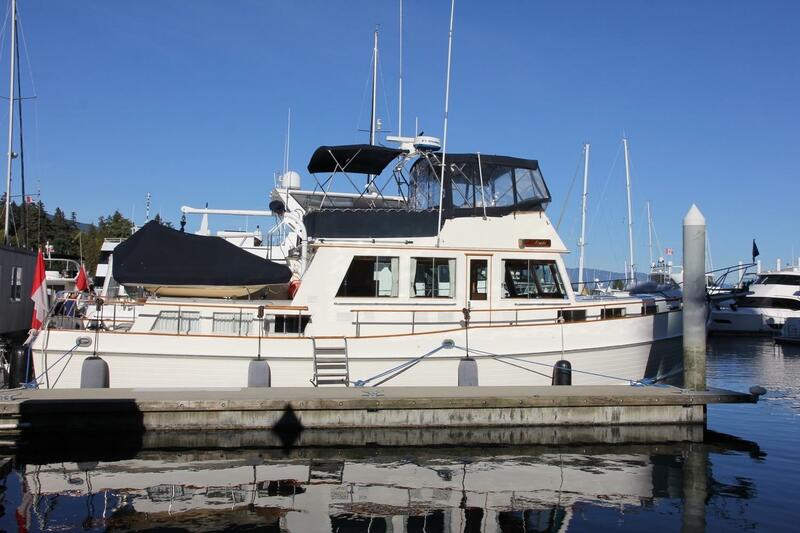 Grand Banks 49 enjoys a reputation for seaworthiness and dependability. 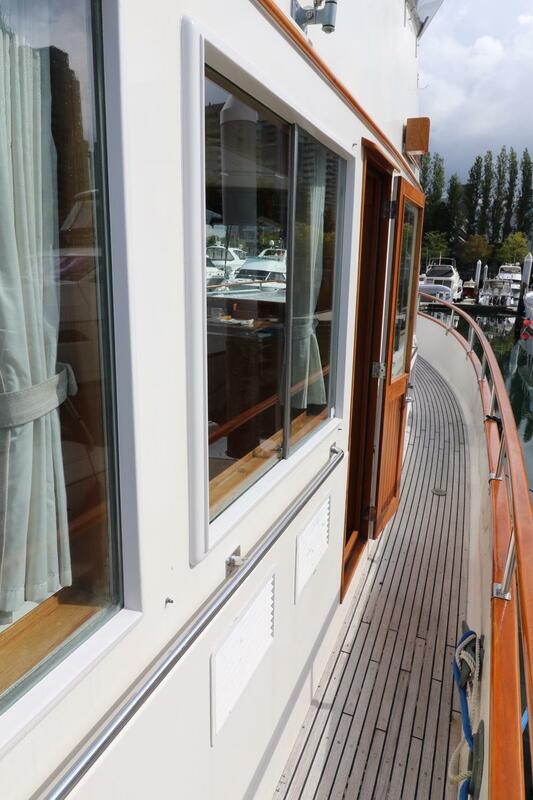 A result of her proven design, rugged construction, and no compromise approach to quality. 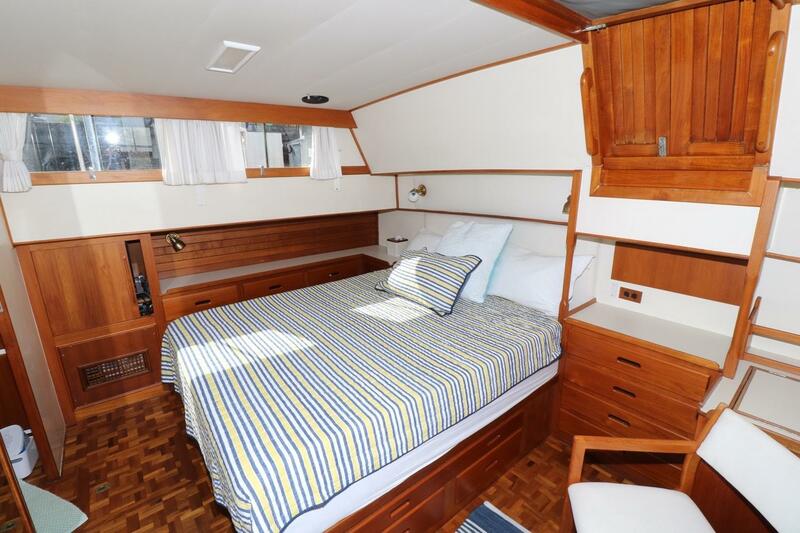 The real beauty of the Grand Banks 49 Classic is her intelligent approach to cruising, Lorelei is an ideal yacht for the cruising couple who want plenty of room for family or guests and the ability to cruise for extended periods. 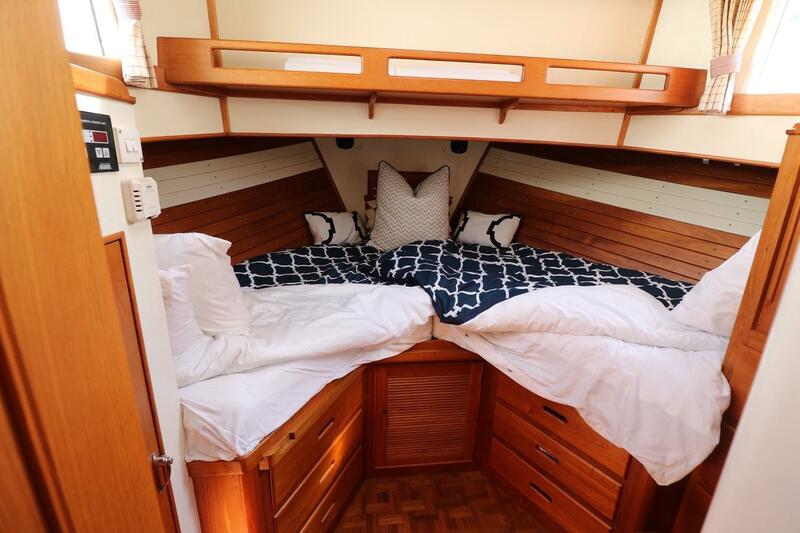 Her generous displacement, provides big boat performance and comfort, and her sensible design makes it possible for a couple to go off on their own for a voyage of a lifetime. 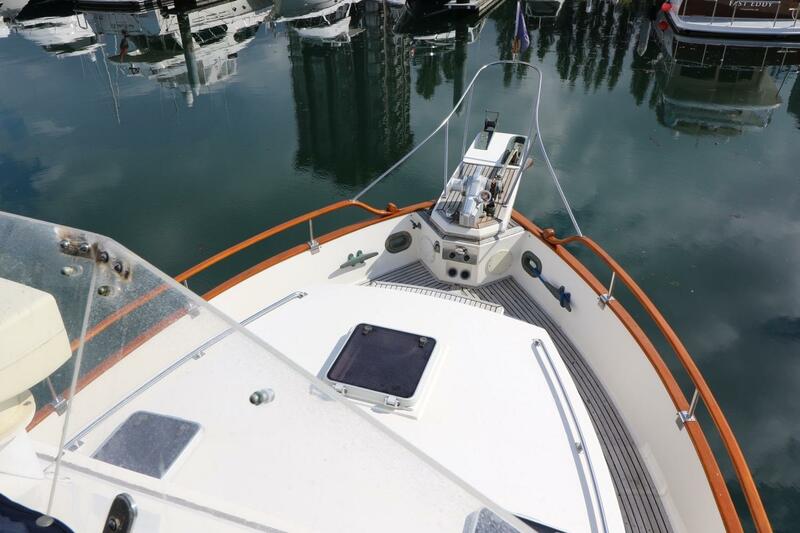 Serious cruisers throughout the world have chosen the Grand Banks 49 to take them to faraway shores in comfort and style. 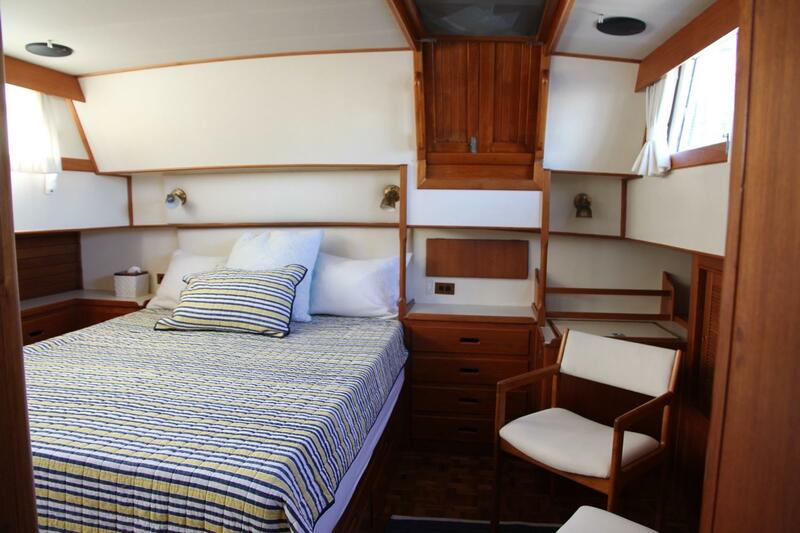 Lorelei is a fine example of this three cabin layout with the helm station, galley and generous salon all on the main level. 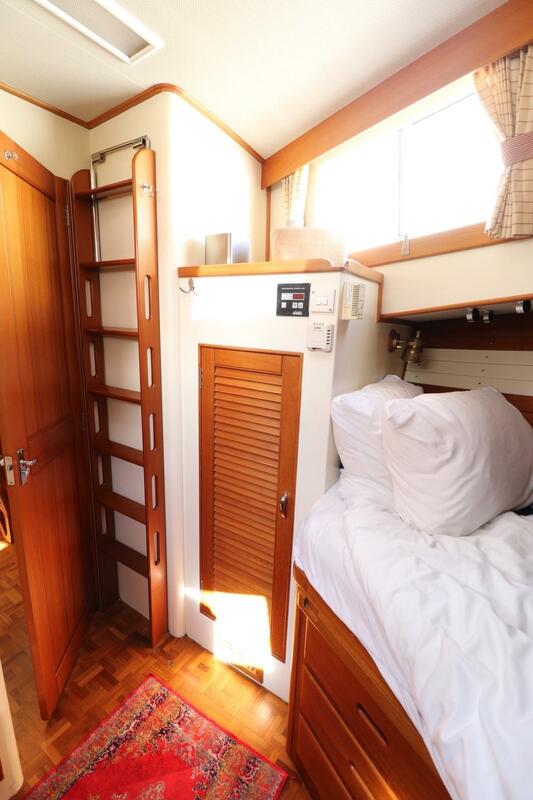 Down and forward are two guest cabins, one with twin bunks, the other a double v-berth, also a private head with separate shower stall. 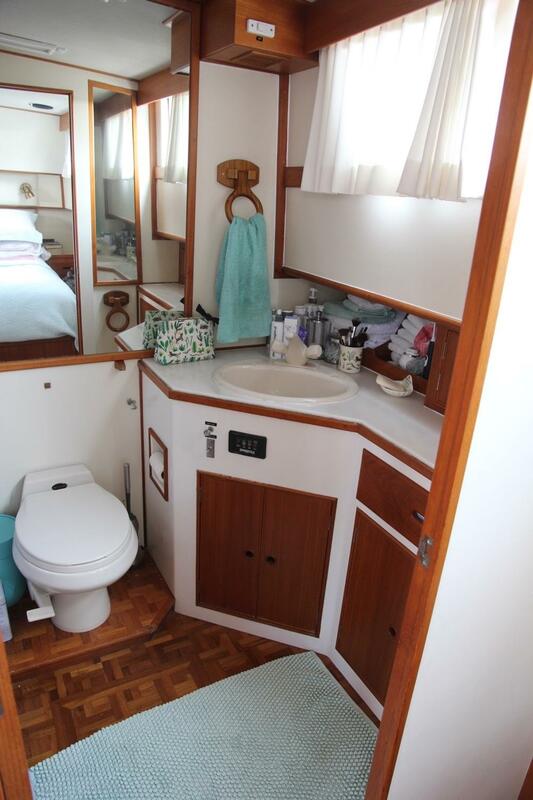 Aft of the main salon is the master suite with a centre-line walk-around queen berth, private ensuite, head and shower stall, full size washer and dryer, large hanging lockers, ample storage and a built in desk with chest freezer. 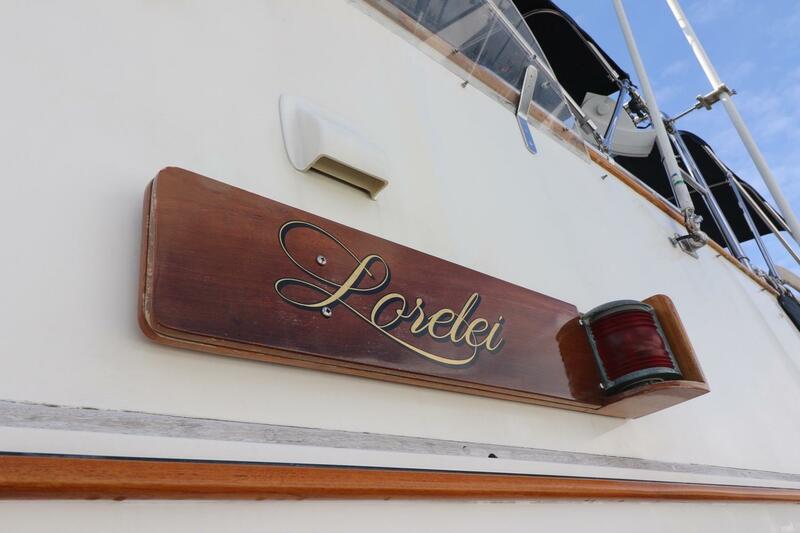 Finishing throughout Lorelei is in beautifully fitted and varnished teak, as is to be expected in all Grand Banks yachts. 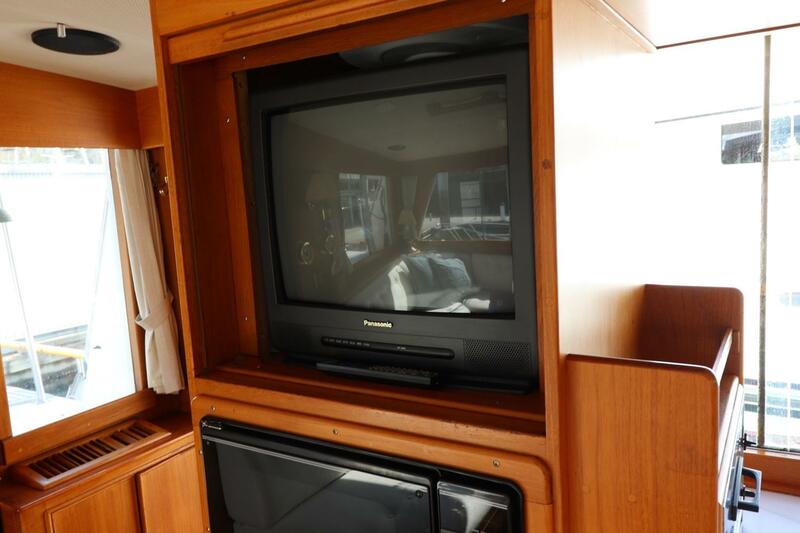 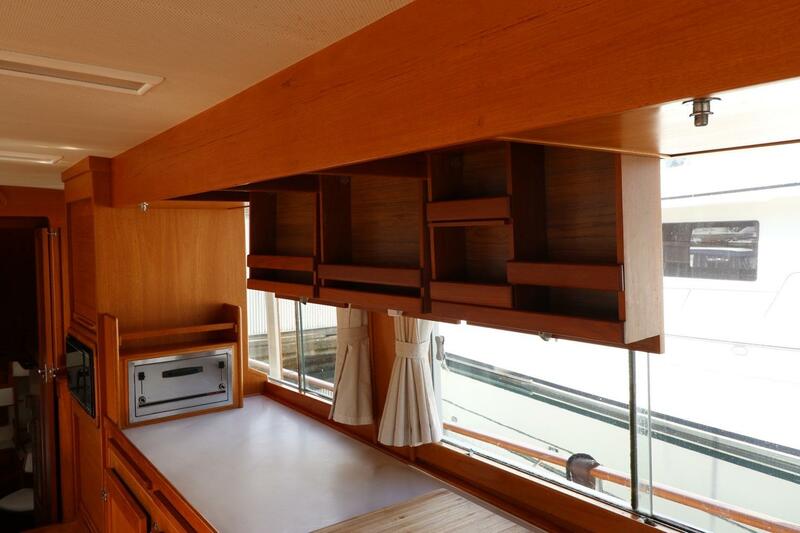 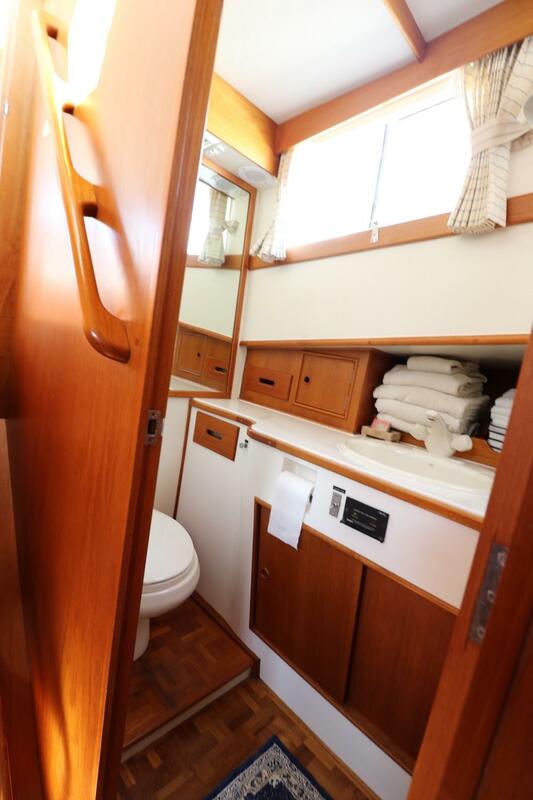 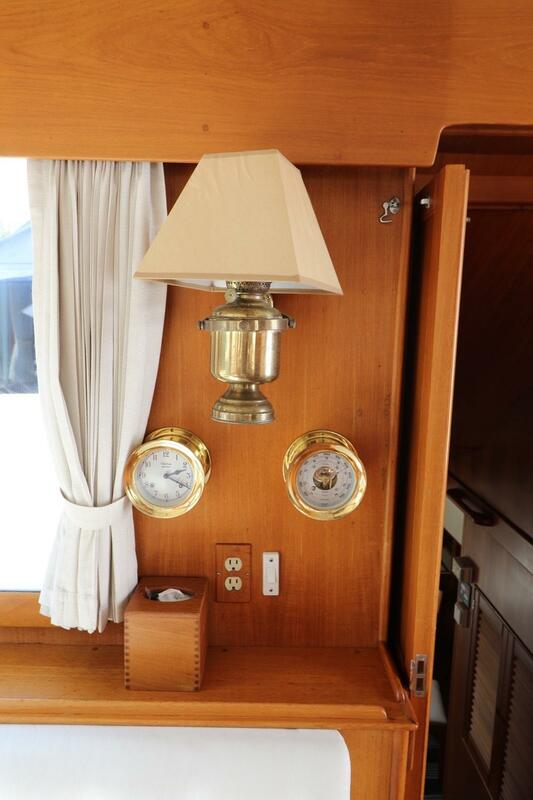 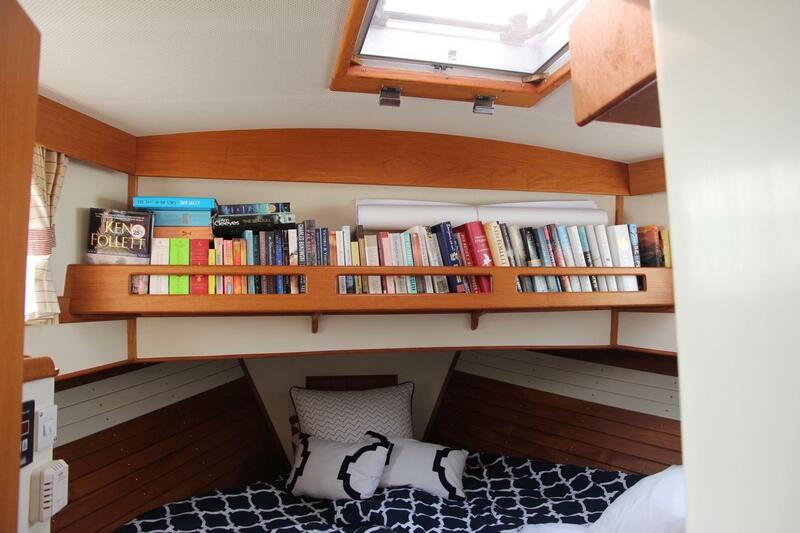 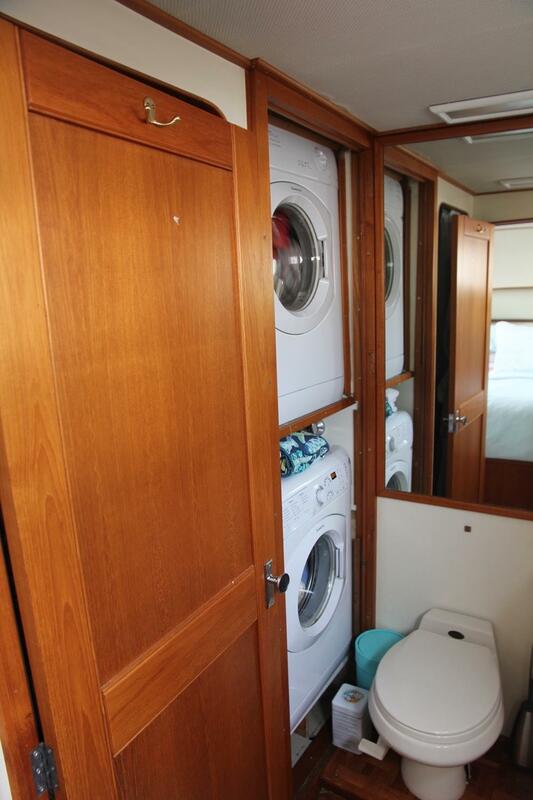 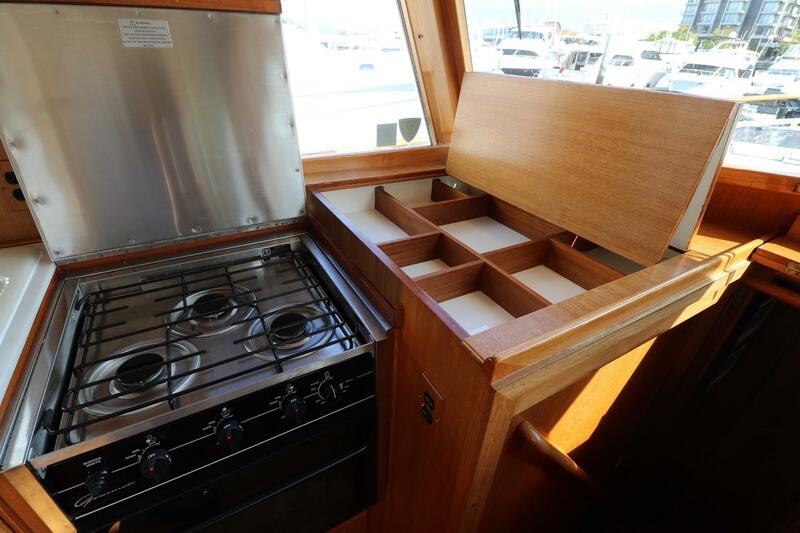 There is abundant storage throughout the yacht in built-in teak cabinets, drawers, shelves, cubbies and more. 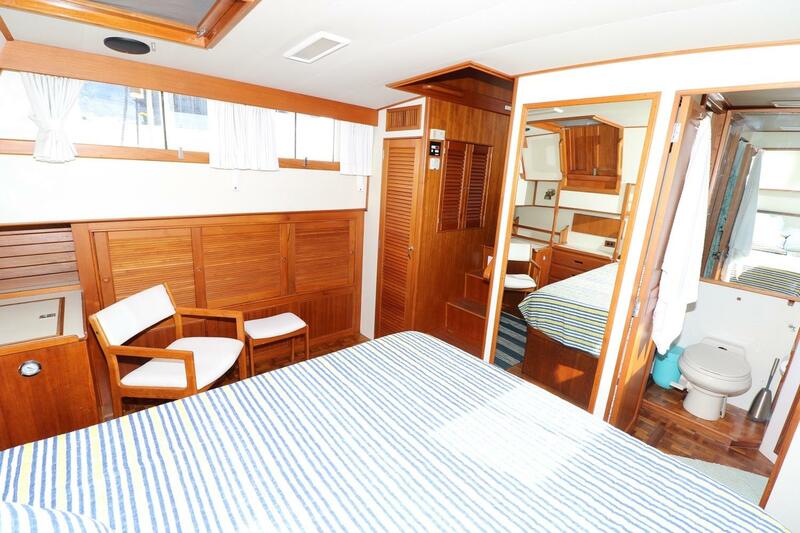 Enter the spacious salon from either side deck through full stand up doorways, the spacious linear galley is located along the port side. 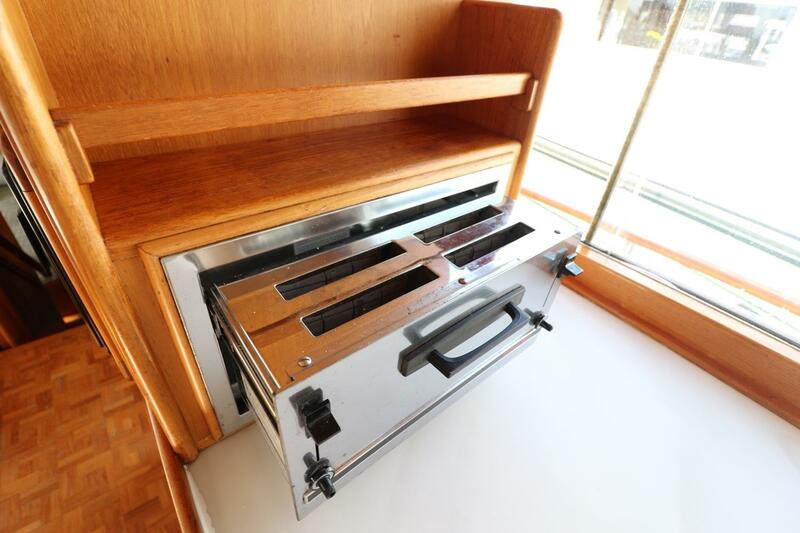 It offers plenty of counter space, built in cutting boards, and overhead storage. 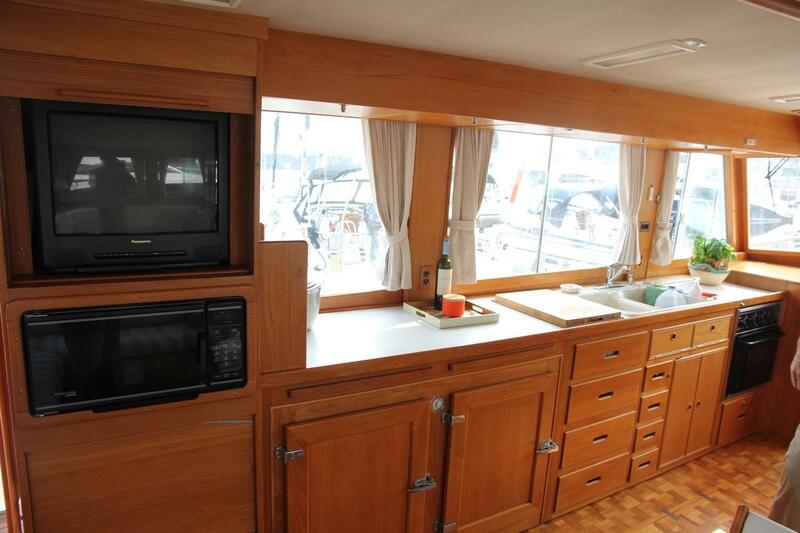 The panoramic view from the full width opening windows will make the chef’s time in the galley even more enjoyable. 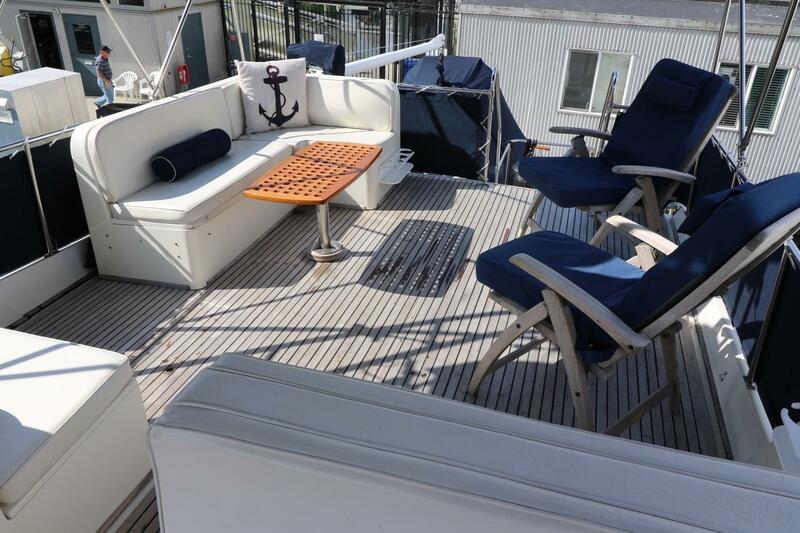 To starboard there is an expansive L-shaped settee with fold down dining table, and an occasional chair. 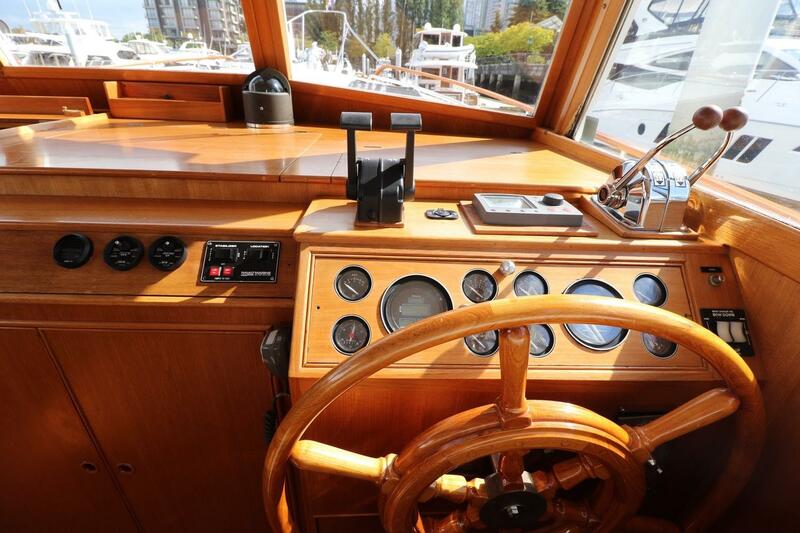 Forward is the lower helm station, with full instrumentation and controls and built in double helm seat. 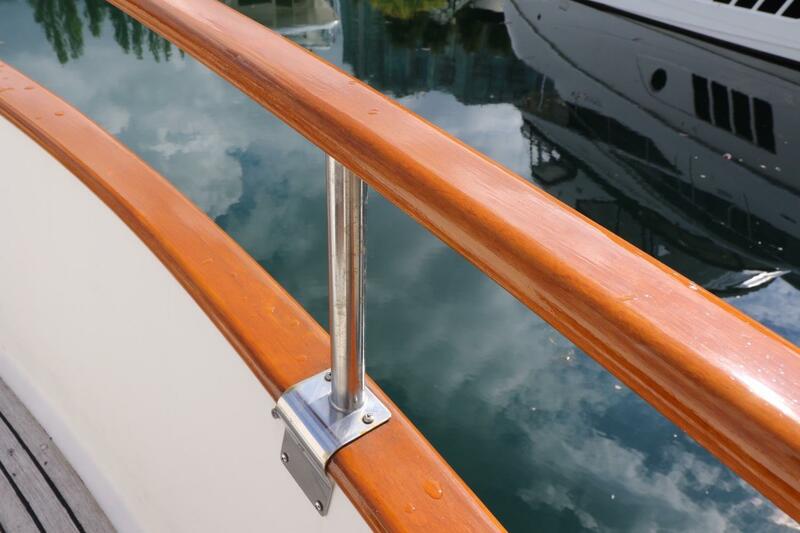 Teak overhead hand grab rails extend full length of the salon. 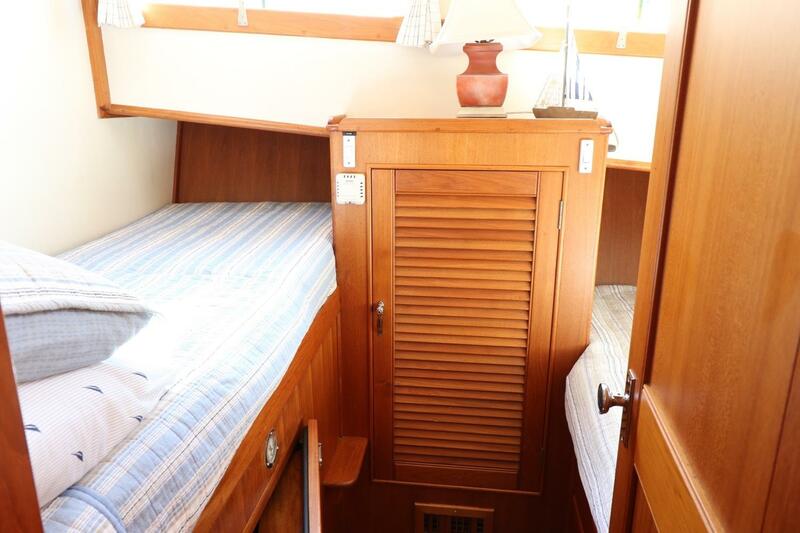 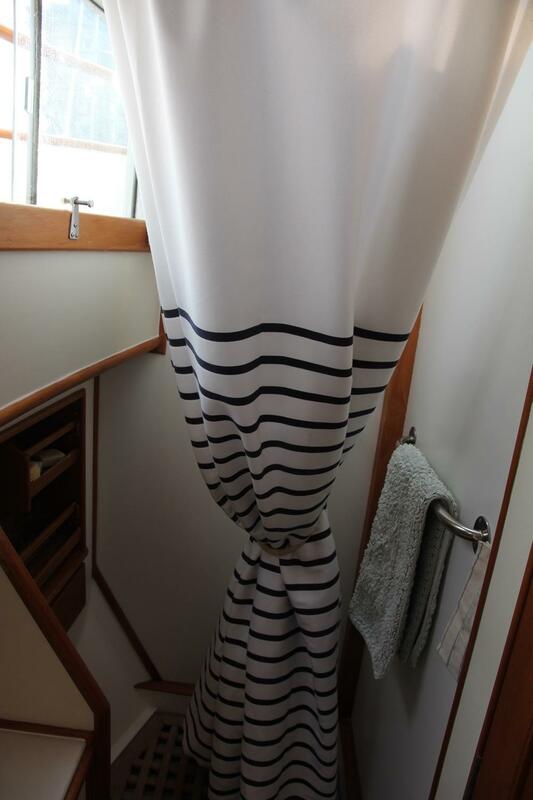 Aft of the salon and down three steps with built-in storage to the very spacious owners' suite, with private companionway leading to the aft deck. 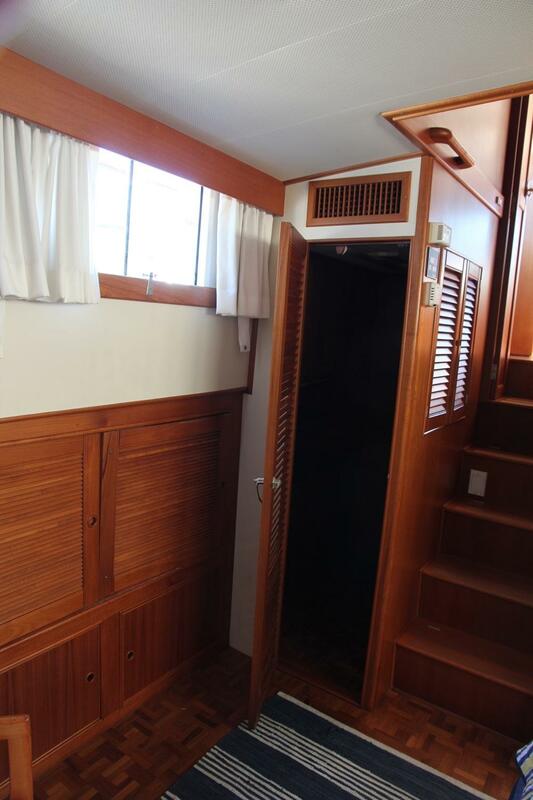 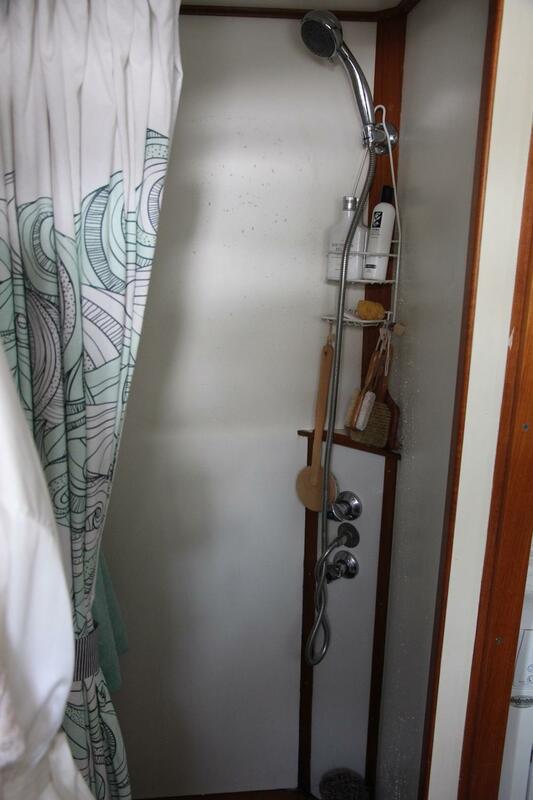 Forward of the salon and down three steps to a hallway, furthest forward is the guest stateroom, starboard is the second stateroom and portside is the shared ensuite. 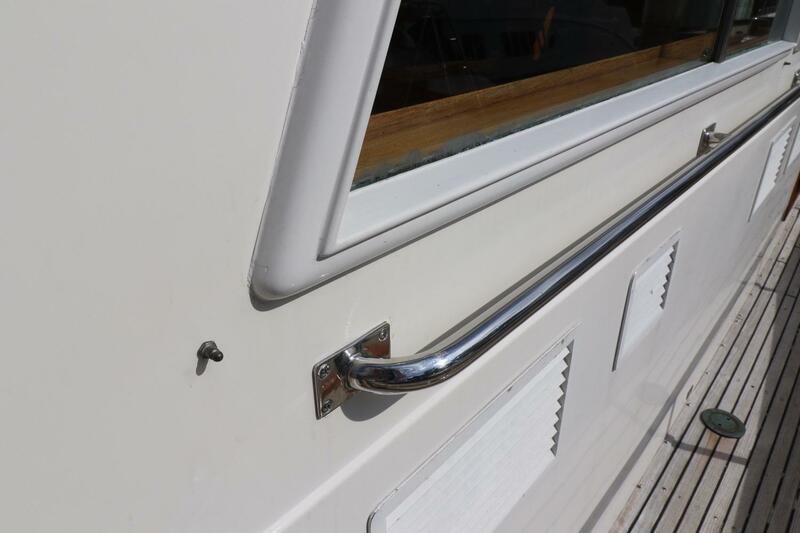 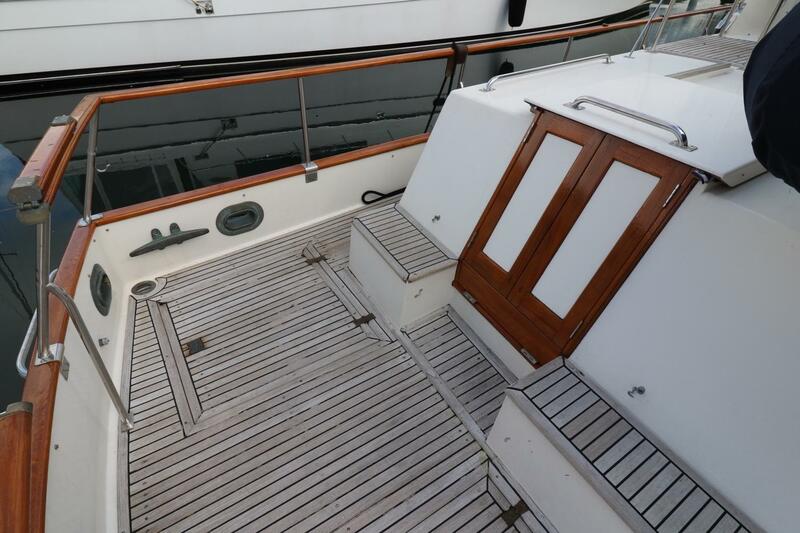 Access the yacht from the dock via the port and starboard side gates to the wide safe side decks, another Grand Banks hallmark design, or from the ladder up to the aft deck off of the wide teak swim platform. 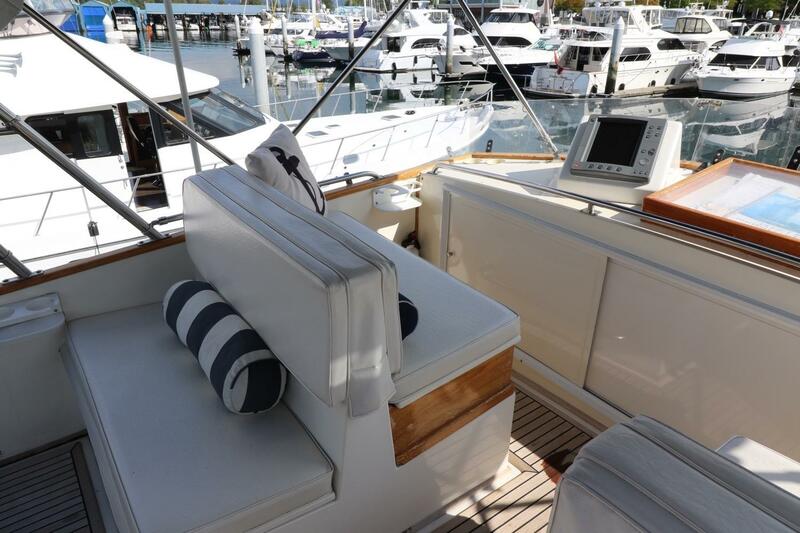 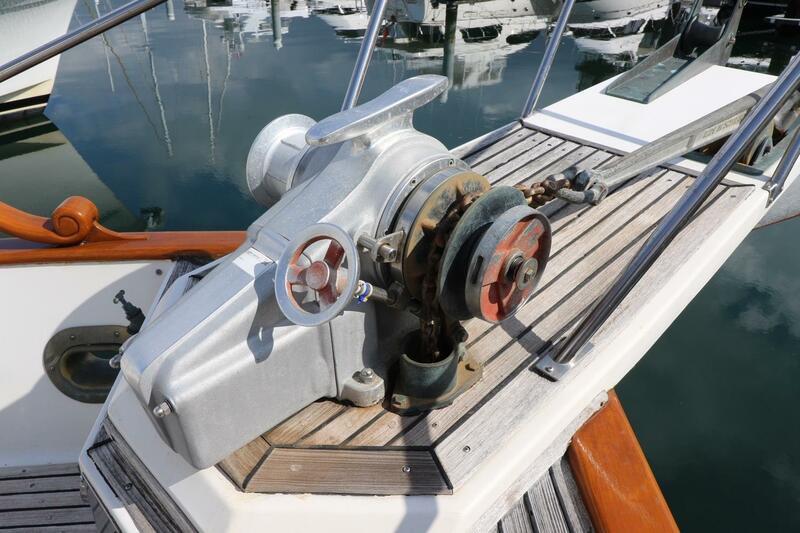 There are two large lazzerettes on the aft deck, and gentle steps up to the flybridge. 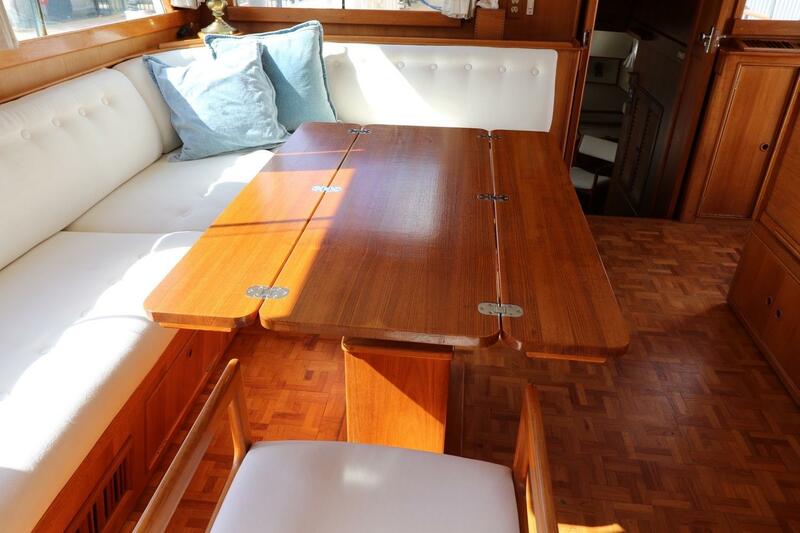 The aft end of the flybridge has a large L-shaped settee to starboard, with two teak chairs and table opposite, the standard fore-and aft facing benches at the helm. 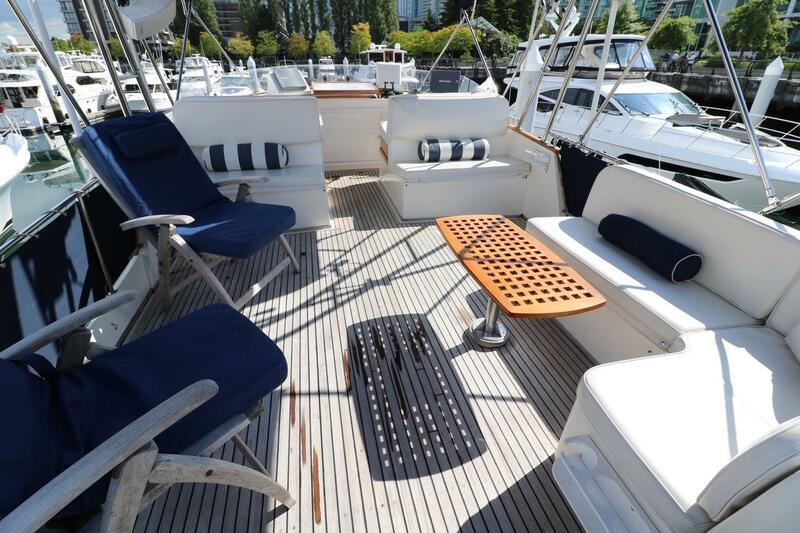 Forward facing seats are raised providing unparalleled visibility while seated. 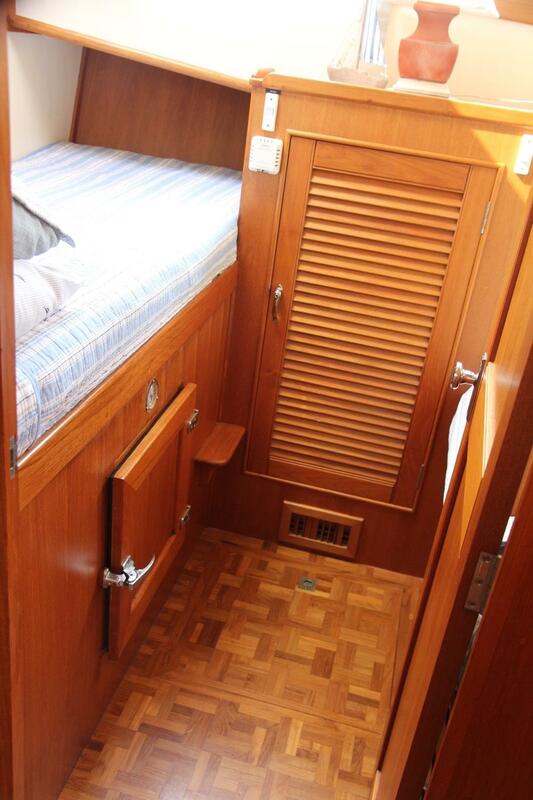 Storage under all the settees. 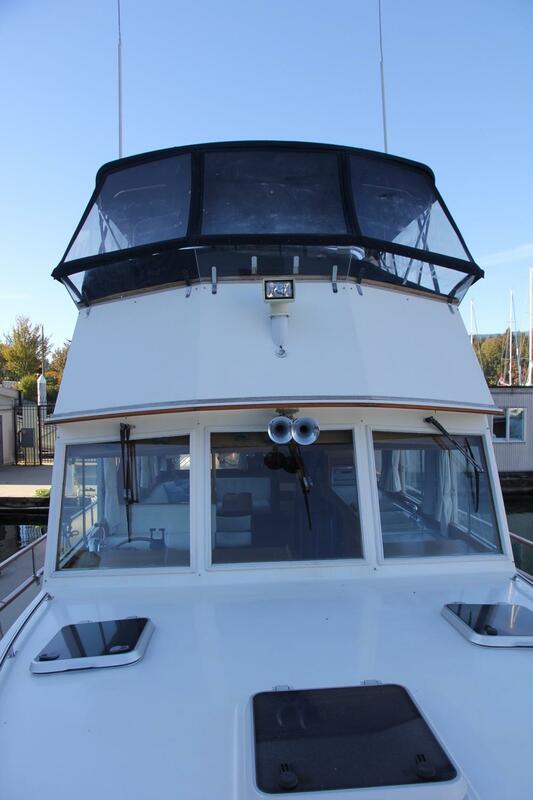 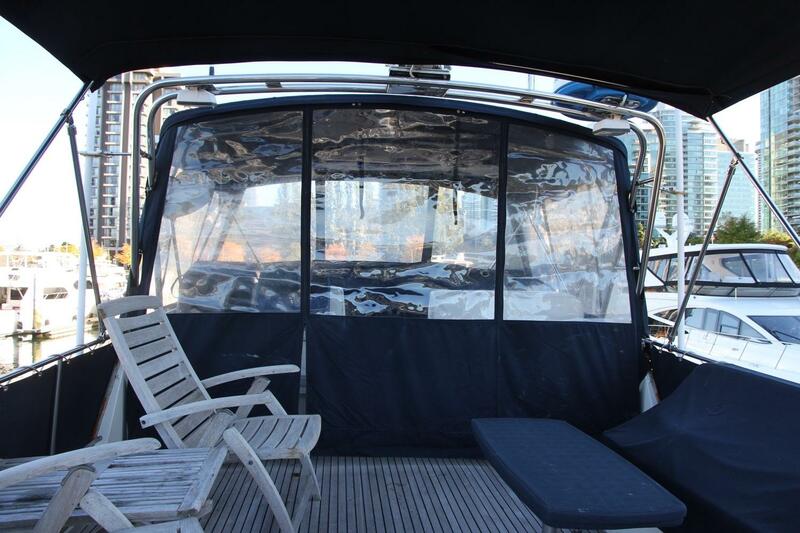 There is a bimini covering the entire flybridge and a full enclosure on three sides with zip-out windows. 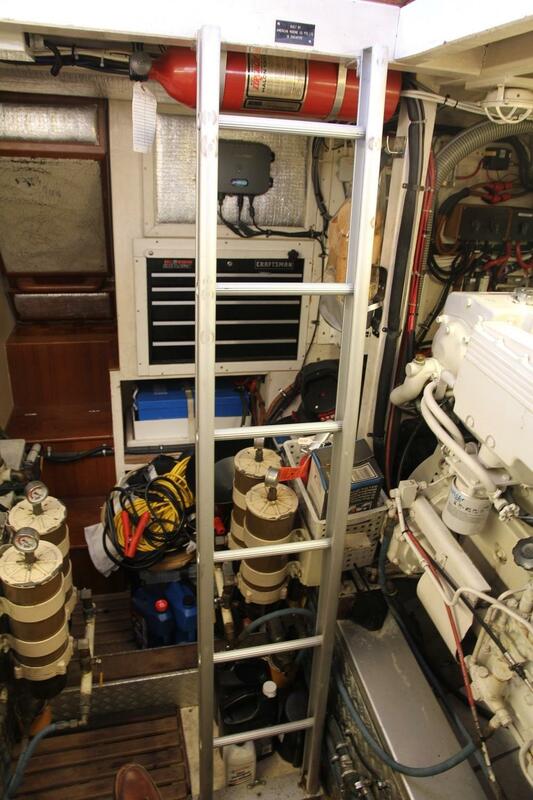 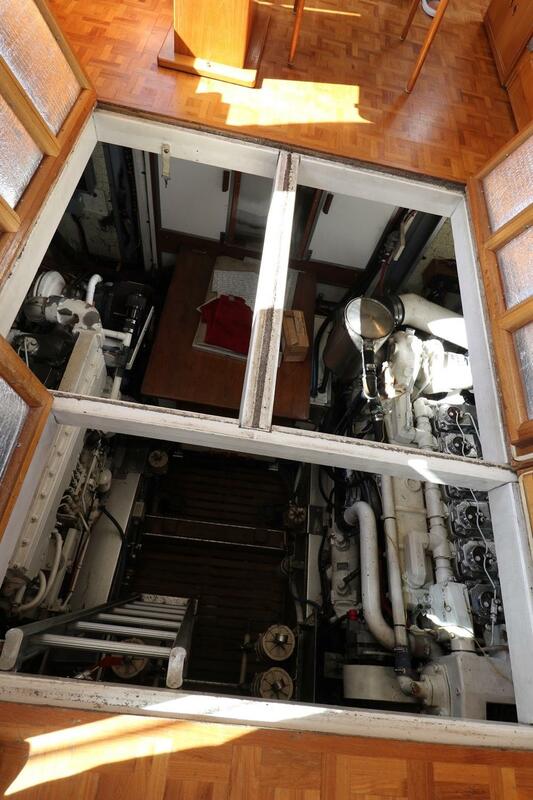 There is another storage locker on the foredeck. 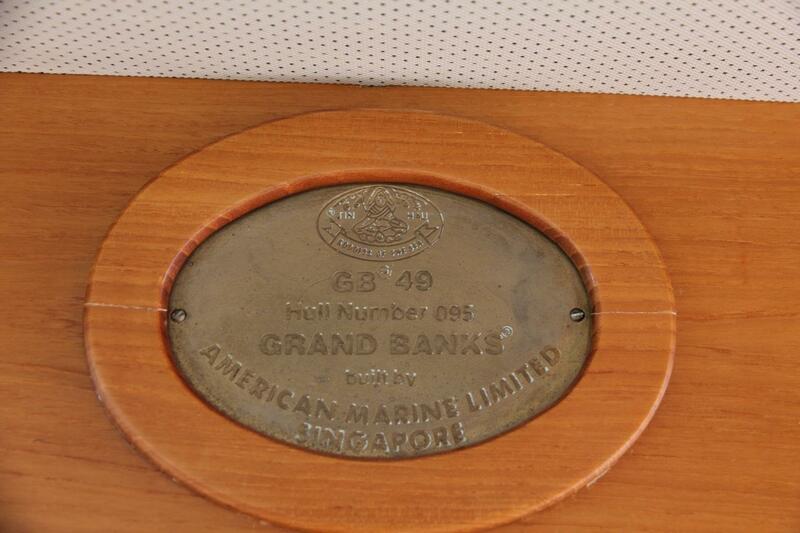 Hi there, I would like more information about the Grand Banks 49 Classic.